The OxyReduct® active fire prevention system enhances safety in the world’s largest high-bay freezer warehouse. When it comes to fire prevention, Preferred Freezer Services focuses on risk minimization rather than loss adjustment. he figures are impressive: three protected areas with a total volume of over 40M cubic feet, 98.4´ shelving systems, 117,000 pallet storage spaces and an order volume of over US$100 million. It stores and unloads around ±900,000 tons of frozen food per year, which make it the largest, automated, high-bay freezer warehouse in the world. In the US, this colossus is also uncommon in its structure. Not only are high-rack storage facilities fairly rare in the US, those with deep-freeze capabilities are even rarer. Preferred Freezer Services consciously chose this design as the best and most efficient solution for their automated logistics processes for storage and distribution. When it comes to fire prevention, however, warehouses of this size and capacity do present special challenges. 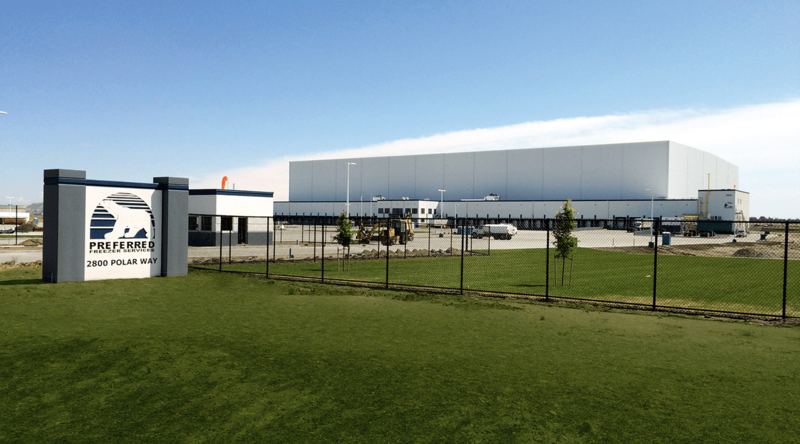 Preferred Freezer Services’ automated, high-bay freezer warehouse in Richland, WA, is the largest of its kind in the world. 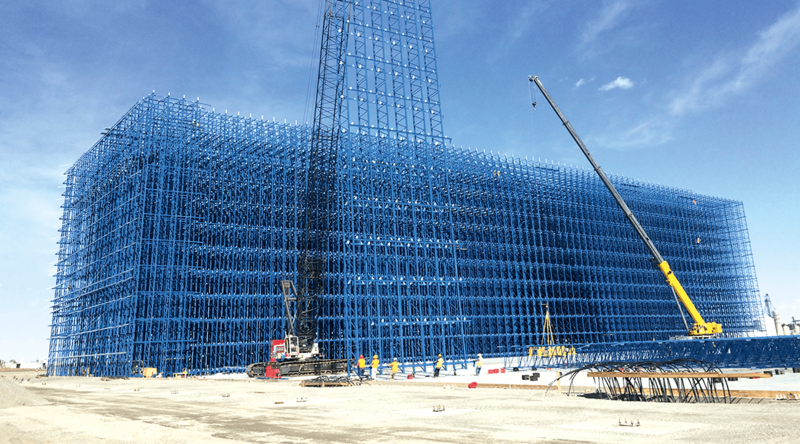 The fire prevention system installed in the freezer facility is an OxyReduct® Pressure Swing Adsorption (PSA) system specially adapted to the site’s structural conditions. The system’s principle is based on lowering the air’s oxygen concentration in the warehouse through controlled introduction of nitrogen. The right level of oxygen was determined on the basis of fire tests considering ignition thresholds of the stored goods packaged in dispatch-ready cartons as well as the negative temperatures (-10°F) in the warehouse. The results of fire tests were approved by the independent German authority VdS (Organization of Property Insurers). In the US, conventional sprinkler technology is still the norm. Very tall rack systems, however, quickly push sprinklers to their limits. In a high-rack storage facility with a height of ±100´, there is no guarantee that the water intended to extinguish the fire will even reach the source of the fire. In densely packed warehouses, the extinguishing water can get ‘lost’ amid the racks before it can reach the fire. Even if fire is detected and the sprinkler system is triggered in a timely manner, there is a high probability that the extinguishing water will not effectively hit the source of the fire. The logistically efficient, clad-rack structures are not yet as common in the US as they are in Europe. This was the conclusion drawn by the planning office commissioned to create a risk report that focused on the dimensions of this warehouse in relation to standard market solutions. Constant air movement in a high-rack storage facility would cause the vertically released sprinkler water to swirl around as ice water. In this environment, firefighters’ ability to counter a potential fire was determined to be virtually impossible. In a dark, ice-cold environment with aisles approximately 482’ long and shelves 115’ high, this warehouse would push the firefighters to their physical and technical limits. For Burnie Taylor (GM, Preferred Freezer Services Richland) sprinkler represented an unsatisfactory solution – especially as experience has shown that 50 to 70% of damage within a warehouse is caused as a result of burst water pipes on sprinkler systems or sprinkler heads that are loose or come off during operations. In other words: the consequences for the operator, its employees and the entire region around Richland, would be catastrophic. It was this reason that WAGNER´s OxyReduct® active fire prevention system was selected as the most logical fire protection solution. Katharina Bengsch holds a degree in Social Sciences and has previously worked as a newspaper editor. Since 2013 she has worked as an editor at the WAGNER headquarter in Langenhagen, Germany.